Dementia is the term used to describe the symptoms of a large group of illnesses that cause a progressive decline in a person’s functioning. It is a broad term to describe a loss of memory, intellect, rationality, social skills and what would be considered normal emotional reactions. Dementia causes significant impairment in a person’s day to day functioning. 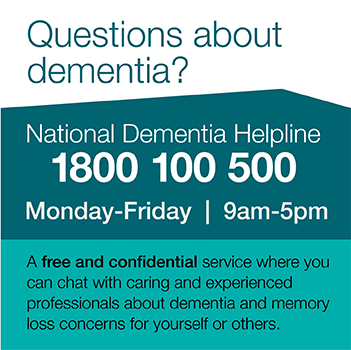 A number of drugs are currently available in Australia for use by people with dementia. These drugs fall into two categories, cholinergic treatments and Memantine. Cholinergic treatments offer some relief from the symptoms of Alzheimer’s disease for some people for a limited time. Drugs known as acetylcholinesterase inhibitors work by blocking the actions of an enzyme called acetylcholinesterase which destroys an important neurotransmitter for memory called acetylcholine. Current cholinergic treatments are approved for use for people with mild to moderate Alzheimer’s disease. A number of the acetylcholinesterase inhibitors are available as subsidised medicines under the Australian Pharmaceutical Benefits Scheme. People may receive these drugs at nominal cost if a physician or psychiatrist has found them to have a diagnosis of Alzheimer’s disease. They must show improvement on a commonly used test of mental function in the first six months of treatment in order to receive further supplies of subsidised medication. Memantine targets a neurotransmitter called glutamate that is present in high levels when someone has Alzheimer’s disease. Memantine blocks glutamate and prevents too much calcium moving into the brain cells causing damage. It is the first in a new class of therapies and acts quite differently to the acetylcholinesterase inhibitors that are currently approved for treatment in Australia. Memantine is currently approved for use for people with moderately-severe to severe Alzheimer’s disease. It is available at subsidised rates under the Pharmaceutical Benefits Schedule for those who meet the criteria for diagnosis and stage of disease. It is important that the person has a firm diagnosis of Alzheimer’s disease, not another form of dementia and to determine which stage the disease is in. A specialist, such as neurologist, psychogeriatrician, geriatrician or psychiatrist, will usually be involved in the prescription of these drugs. Dementia often causes a number of behavioural and psychological symptoms which can be very distressing. These may include depression, anxiety, sleeplessness, hallucinations, ideas of persecution, misidentification of relatives or places, agitation and aggressive behaviour. These symptoms may respond to reassurance, a change in the environment or removal of the source of any distress such as pain. However, sometimes medication may be required for relief. Major tranquillisers, also known as neuroleptics or anti-psychotics, are used to control agitation, aggression, delusions and hallucinations. Haloperidol (Serenace) is one commonly used drug. In modest doses this drug tends to cause symptoms similar to Parkinson’s disease such as stiffness, shuffling gait and shakiness, and older people are very prone to these side effects. Some are unable to tolerate even low doses of Haloperidol. Newer tranquillisers such as Risperidone (Risperdal) have fewer Parkinson’s like side effects and have been studied more intensively in people with dementia than Haloperidol has. Risperidone appears to be helpful for the treatment of aggression and psychosis, but may be associated with a slight increase in risk of stroke. Olanzapine (Zyprexa) and Quetiapine (Seroquol) are sometimes used, but have been less comprehensively studied in the treatment of dementia, and there is some evidence that Olanzapine may also be associated with increased risk of stroke. Symptoms of depression are extremely common in people with dementia. Depression can usually be effectively treated with anti-depressants, but care must be taken to ensure that this is done with a minimum of side effects. Anxiety states, accompanied by panic attacks and unreasonable fearfulness can be very distressing for a person with dementia and place considerable stress on family and carers. Short-lived periods of anxiety may be helped by a group of drugs known as benzodiazepines. While benzodiazepines are very effective for reducing anxiety in the short term, most individuals rapidly become used to their effects and they become less beneficial with time. Withdrawal of benzodiazepines is often associated with a rebound of anxiety symptoms and should not be undertaken without medical advice. Persistent waking at night, and night time wandering can cause a lot of difficulties. Many drugs commonly prescribed for dementia can cause excessive sedation during the day, leading to an inability to sleep at night. Increased stimulation during the day can reduce the need for sleep inducing medications at night. Medication to treat sleep disturbances should be a last resort, as people may become dependent on these and withdrawal of the medication may be followed by rebound sleeplessness and anxiety. All drugs can have side effects, some of which may make the person’s symptoms worse. Always ask the doctor why the drug is being prescribed and what side effects might occur. A drug which is useful may not continue to be effective indefinitely because of the progressive changes to the brain caused by dementia. Do not expect immediate results. Benefits may take several weeks to appear particularly with anti-depressants. Discuss this with the doctor. It is important that treatment is reviewed regularly. Keep a record of all medications, including alternative medications. Take this record to medical appointments. Many people with dementia take a number of medications for different symptoms. It is important to discuss with the doctor any impact that medications may have on each other. What are the potential benefits of taking this drug? How long before improvement may be noticed? What action should be taken if a dose is missed? What are the known side effects? If there are side effects, should the drug be stopped? If the drug is stopped suddenly, what happens? What drugs (prescription and over-the counter) might interact with the medication? How might this drug affect other medical conditions? Are there any changes that should be reported immediately? How often will a visit to the doctor who prescribed the drug be needed? Is the drug available at a subsidised rate? What is younger onset dementia?